Jewish Home chairman: Don't jump to conclusions while investigation into soldier who shot a terrorist is ongoing. Jewish Home chairman and Education Minister Naftali Bennett on Monday once again called on the public and on his fellow politicians not to jump to conclusions regarding the soldier who was filmed while shooting a wounded Arab terrorist, so long as the investigation in the case continued. Speaking to Channel 10 News, Bennett also continued his back and forth on the issue with Defense Minister Moshe Ya’alon, hours after Ya’alon repeated his criticism against coalition members who gave the soldier backing, slamming the "harsh words and publication of false information, and the manipulation and the attacks against the Chief of Staff - against me is still permissible, (as) a politician, (but) against the Prime Minister and the Chief of Staff (is not)." "Then the case goes to young Military Police investigators, and how can they conduct themselves in an objective way?" Bennett continued, demanding that the murder charges against the soldier be dropped. Soldiers acting on a battlefield, in such a situation, cannot be branded murderers, he said. "We sent him to defend us in battle. He may have erred seriously, maybe not. We need to hear him." 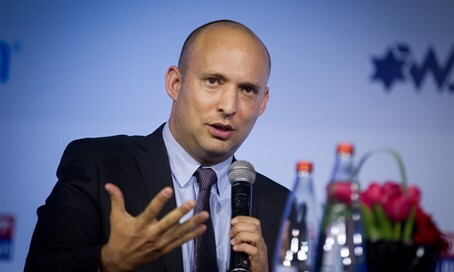 Bennett also responded to Ya’alon’s criticism earlier in the Knesset, and stressed that he fully backs IDF Chief of Staff Gadi Eisenkot, despite Ya’alon’s claims to the contrary. "We have an excellent Chief of Staff. The Defense Minister attacked me because I spoke with the family of the soldier - I 'plead guilty'. They do not need to be boycotted; they are a normative family with four sons who served in combat roles in the army,” said Bennett. The soldier insists he shot the terrorist over concerns he was moving to detonate a bomb belt that was thought to be hidden under his unseasonable coat. That version of events was corroborated on Monday by a Magen David Adom investigative committee, which found concerns that the terrorist was hiding a bomb had not been ruled out.